As you may have already deduced from earlier posts, Lebanon is full of old stuff. Much of it is poorly preserved or else some new horrible concrete monstrosity has been built over the top of it. But just occasionally, the odd historical gem has been left in good condition. Two such examples are Baalbek and Aanjar, both of which are in the Bekaa valley. 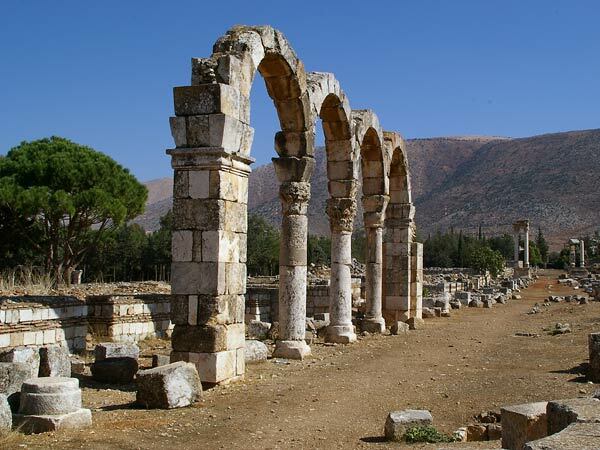 Aanjar is often cited as the only real remaining Umayyad site in Lebanon – a remnant of the 7th and 8th century Muslim caliphate. The area was only rediscovered in 1939 after several thousand Armenian refugees settled there, with excavations commencing ten years later. Walking along the main street of this walled town you get a real feel for what life might have been like back then. Hundreds of shops are clearly visible, as are the bathhouses, mosques and two palaces. It’s history that you can reach out and touch. And as is so typical of historical sites in Lebanon, on any given day you’ll have the place all to yourself. Certainly Christopher and I did, on a glorious autumnal day. Baalbek is widely considered as a Roman ruin, but the Romans merely expanded and improved upon a much older site focused on hedonism and the worship of the Sun God. Baalbek is the home of the original Bacchanalian feast, with ritualised prostitution and other pleasures of the flesh and soul. Oh, and the odd bit of human sacrifice too. Upon first arriving in the town of Baalbek you have to fight your way through a horde of annoyingly persistent street hawkers trying to flog off Hizballah t-shirts and crappy postcards, as well as a bunch of ratty kids offering to watch over your parked car (as if anyone’s going to break into your car in the middle of Hizballah territory – you could leave the keys in the ignition and no one would flog your ride). Then eventually you get into the site, and WHAM, you’re confronted by the sheer scale of this place. There are a bunch of different parts to the complex but the most impressive are the six remaining columns from the old Temple of Jupiter, and the almost complete Temple of Bacchus. The columns of both tower above you and it really is quite amazing to stand at the base of these monsters and look up at the capitals 40-50 metres above you. Needless to say, the photos below just don’t convey how big these temples are. As with many of the sites you have captured on your whizbang digital camera they look suitable for Angelina Jolie, Harrison Ford, Brendan Fraser or even Nicholas Cage to carry out some daring raid of hidden antiquities that will stop the world falling into(HAhahahaha!!!) EEEVIL HANDS. Keep that camera clicking, we all enjoy the scenes plus the background information which so aptly puts them into context. p.s. Christopher never changes does he.